"The cage is giving good service and currently protecting a fine crop of red and white currants with a promising crop of "Stella" cherries. The two doors work well and they are big enough to get a wheelbarrow or my rotavator in easily if I want to. " 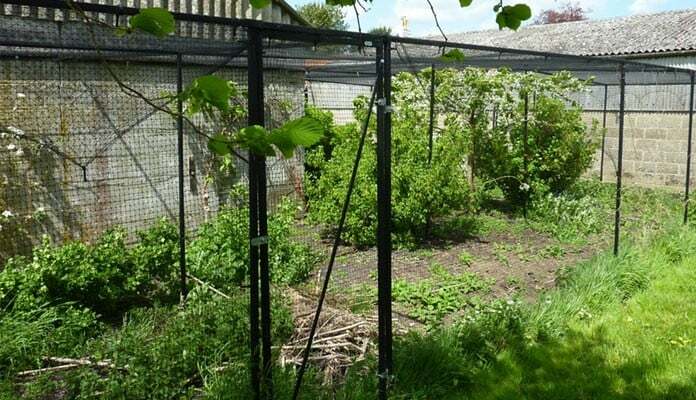 "I purchased a made to measure fruit cage from Harrod Horticultural in 2010 having had good experience with a slightly modified Harrod's fruit cage a few years earlier. We have a fairly large garden but it is fitted around several outbuildings and a couple of barns. We have an ornamental area but our main interest is to grow fruit and veg, in soil that is well fertilised thanks to the manure from our Suffolk Punch Horse. 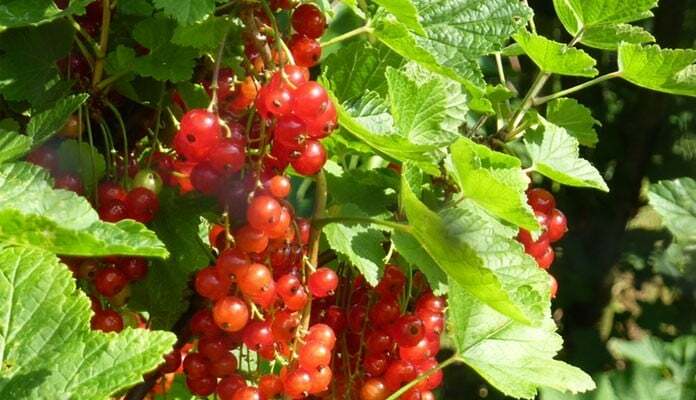 Red-currants and cherries were doing well near our compost heap but the fruit was taken by the birds. My own DIY protection from ordinary netting and a few metal uprights was effective but a nightmare to get in and for cultivation or picking. I decided to get a proper cage but I did not want to waste space on the L-shape plot. 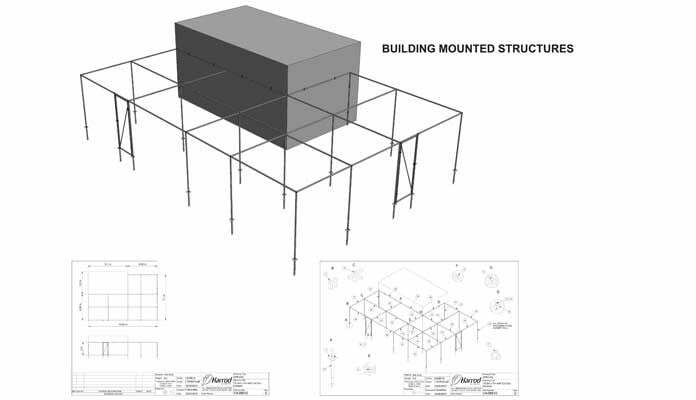 I provided your planning team with measurements and diagrams and a made to measure L-shape cage duly arrived by carrier. Erection of the frame was not a particular problem but it was harder to fit the netting. A small deficiency in side-wall netting was soon sorted out but it was hard to fit the roof netting. It was provided in two pieces without any real hints on how to fit it. The net is so flexible that it is almost impossible to measure once it has been unwrapped. It also turned out that the net was only just big enough without overlaps. That made it hard to fit originally and even harder to replace after rolling up to protect the frame from snow damage. I am pleased to say that your service department has now provided me with two larger pieces of net that are much easier to fit and maintain. The cage is giving good service and currently protecting a fine crop of red and white currants with a promising crop of "Stella" cherries. The two doors work well and they are big enough to get a wheelbarrow or my rotavator in easily if I want to. 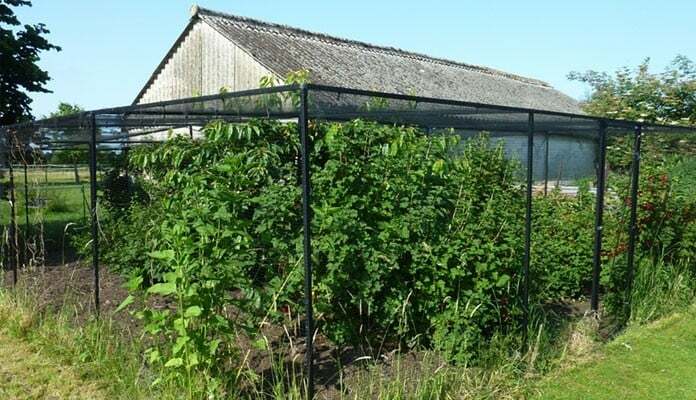 Originally I had a problem with birds getting under the tightly fitting side wall netting but this now better with less net tension and allowing the grass to grow up a bit to seal any ground/net gaps."